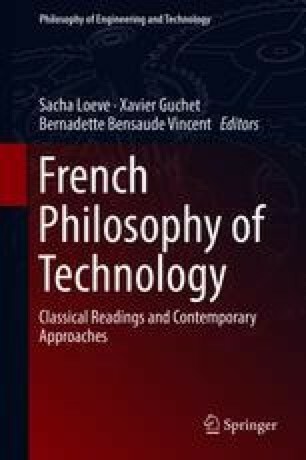 Known for being a major representative of the French postphenomenology, Jean-François Lyotard’s also provides an important contribution to the development of the notion of “technoscience.” This chapter endeavors to establish the originality of Lyotard’s understanding of technoscience, one that brings into play notions such as performativity, force, as well as precarity, sensibility, and vulnerability, and further still an original understanding of the “inhuman.” It is also a matter of showing that if the notion only appears relatively late in Lyotard’s work, one can bring out developmental strata in all of his work that, from a certain point of view, prepare the way for it. This chapter has been written in French for this volume and translated by Daniel J. Palumbo†, The Pennsylvania State University. These pages are dedicated to his memory. Déotte J.-L. (2012). Les immatériaux de Lyotard (1985): un programme figural. Revue Appareil [online], 10/2012, URL : http://appareil.revues.org/797; https://doi.org/10.4000/appareil.797.